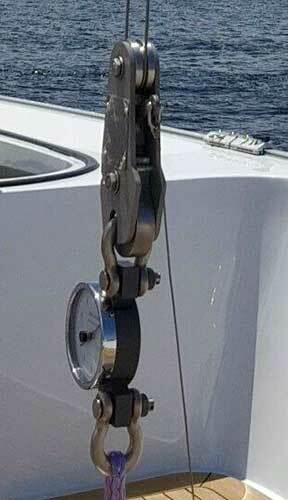 Please see the News and New Products available from Nance & Underwood Rigging and Sails. 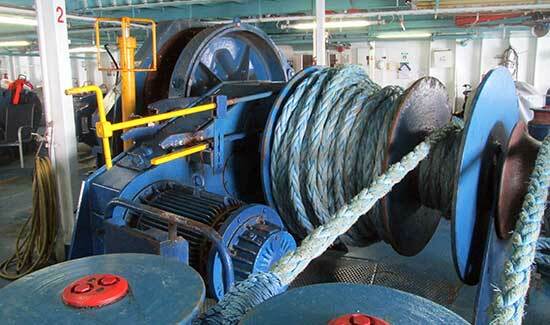 Check back often for updated information on rigging, winches, masts, furling, sails and other fine marine products. See more below. 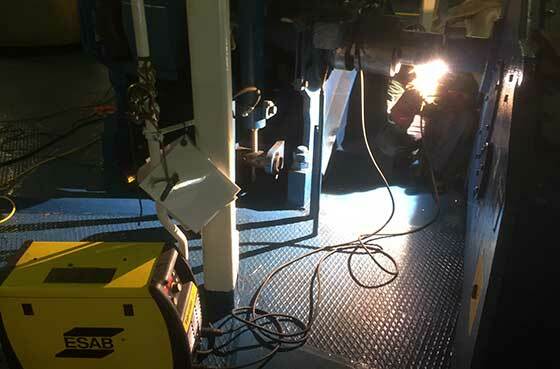 Nance & Underwood Rigging recently performed a Cruise Ship Mooring Deck Equipment Heavy Service in Grand Bahama. Nance and Underwood Rigging just received our U.S. Federal Contractor Registration Verified Vendor Status. 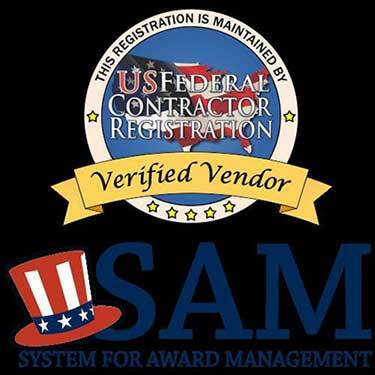 SAM or System for Award Management Verification is awarded to qualified and vetted entities. Nance and Underwood received this Certification for Ship Repair. Many hours of hard work and dedication to the Marine Industry Standards was invested by the Nance and Underwood Staff and Crew. Our thanks to all involved in this process! Nance and Underwood has spent years developing an efficient and cost effect system for providing quality and certified services to all of clients from the sailing community, Mega-Yacht sector and Cruise Line Fleets. This history allows N&U to present the same services to our Coast Guard and Naval Fleets as well as to the US Merchant Marine Service. Contact Houston Murphy for more information. Nance and Underwood Successfully passed an audit by Bureau Veritas not only renewing our in house certificate for load testing lifting appliances, but additionally being authorized to load test lifting appliances on board! This annex to our certificate increases N&U credentials and opens the door for increased services to the mega-yacht and commercial vessel clientele. Nance and Underwood Rigging completed a dry dock repair by N&U Technical Operations. 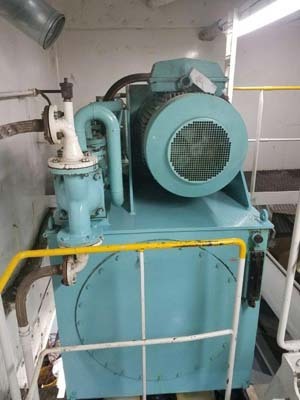 Nance and Underwood Rigging fulfilled a contract for another Mooring Deck Overhaul additionally to Set Mooring Winches after removal for Azipod Re-Work Contact Houston for more . Nance and Underwood Rigging was at Seatrade Cruise Global March 5-8, 2018 here in Fort Lauderdale at the Convention Center. Nance and Underwood Rigging displayed in a Booth for the Show. 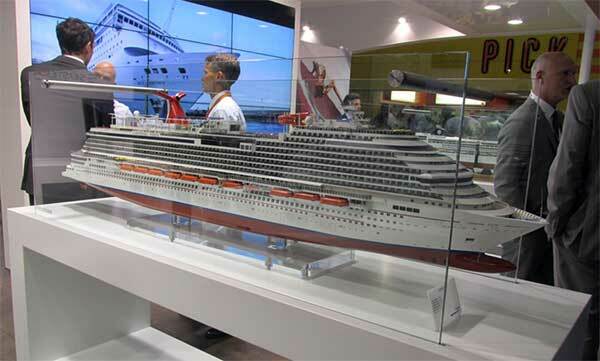 Contact Houston Murphy for more info and to receive an invitation to Seatrade Cruise Global. Nance & Underwood retro-fit a cruise ship open deck theater back sail system while in service. 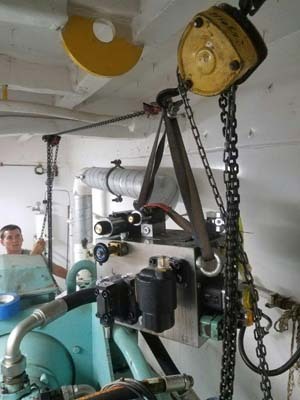 Nance & Underwood repaired a cruise ship mooring winch during haulout requiring on-time efficiency. 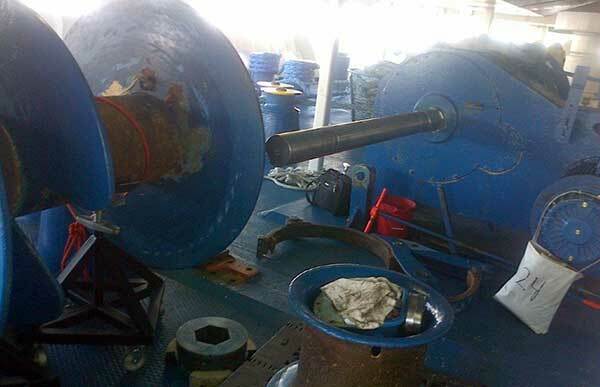 N&U team fabricates and installs windlass clutch claw security bands for safe operation until the new parts arrive. 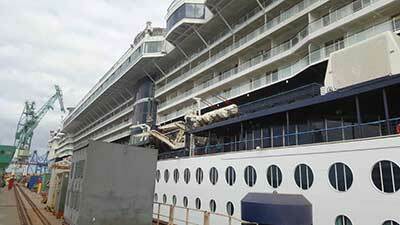 Recent at sea repair to a cruise vessel mooring deck by Nance & Underwood. See larger images on the Commercial Gallery Page. 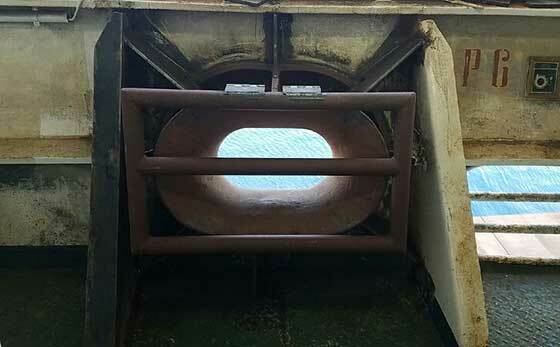 This Panama Chock was installed by Nance & Underwood this week during a dry dock refit. 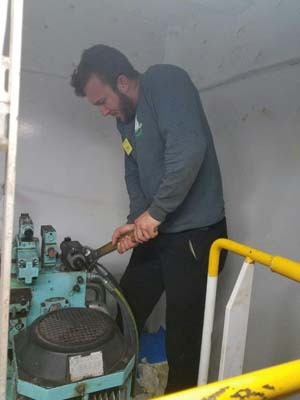 Nance & Underwood Rigging General Manager Houston Murphy was extensively quoted in an article on The Triton. General Manager Houston C. Murphy is a big proponent of crew safety. "At least three recent falls have occurred here within the last year," Murphy said. "I cannot say worldwide how many people are hurt using systems designed to hold fenders or using poorly designed systems." 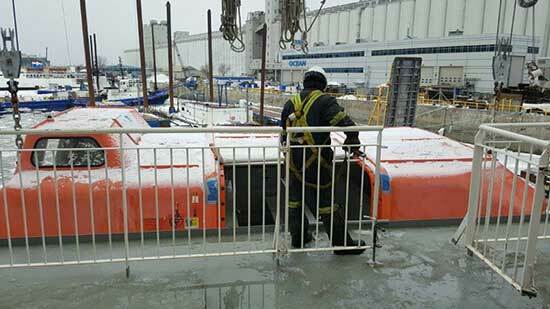 Right: Technician Scott Smith checks and double checks compliant safety access systems, including annual load testing. 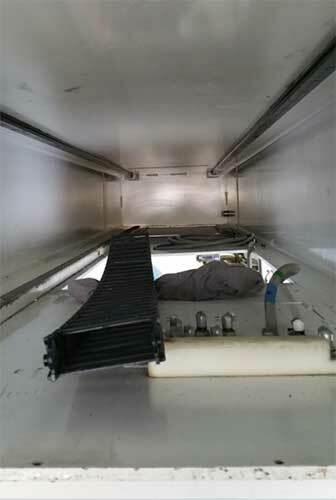 He understands that the hardware is not considered attractive on many yachts, and he has been told that owners don't want to see the rail run the length of the yacht. The company offers a powder coating to hide them. 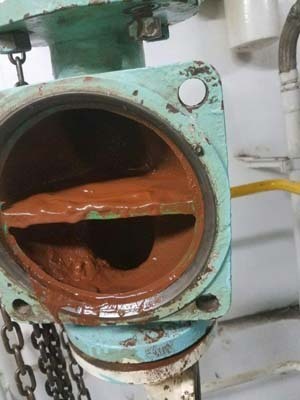 Murphy plays by the book and recites requirements from the Maritime and Coastguard Agency (MCA) for certified tracks, systems, installations and annual inspections. 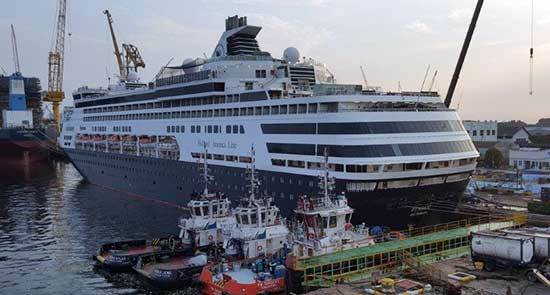 "Crew have to have a five-point safety harness while in the bosun's chair," Murphy said. "The track has to have two cars to hold a person, and some have three." The third car can hold cleaning supplies and tools. "You need to know how to raise and lower yourself, for example, if you want to go down to a window and back up," he said. "We have guys that show crew how to properly use their hiking gear." He thinks non-compliant yachts can still follow safe procedures. "The problem we have had is that they don't follow rules until someone gets hurt," Murphy said. 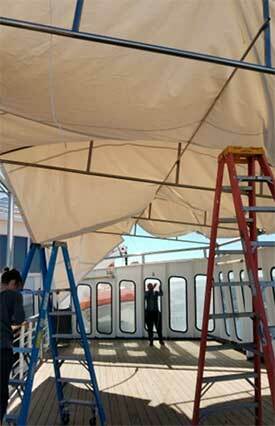 Nance & Underwood fabricated and installed another successful Canopy project on a Cruise Ship. See the PDF for more images. 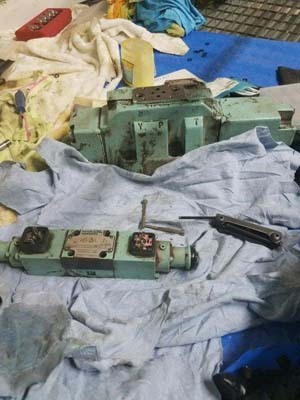 Pictured above is an N&U mooring winch repair. 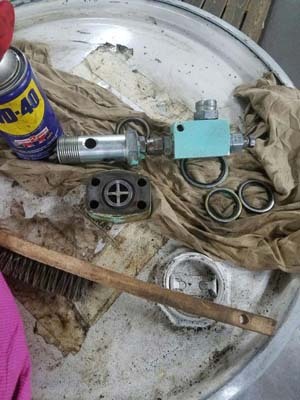 Yet another repair by N&U made while at sea to satisfy a busy client's schedule. 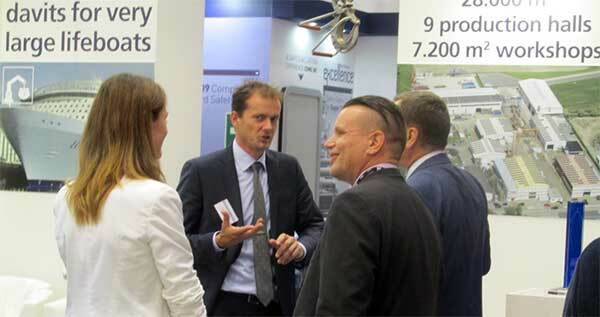 Nance and Underwood Rigging was at Seatrade Cruise Global, Booth 106, represented by Houston Murphy, General Manager. 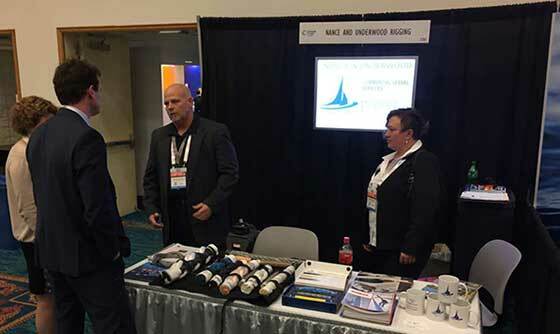 This event March 5-8, 2018 in Fort Lauderdale, Florida at the Convention Center was for the Cruise Ship Industry of which Nance and Underwood provides many services. Contact Houston for an invitation to this worldswide event including Cruise Ship sourcing, networking and education. 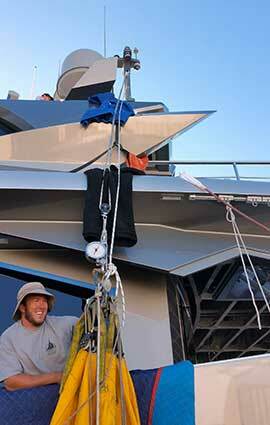 Nance and Underwood Rigging completed the re-work and insertion of this Mega-Yacht's Means of Embarkation. Tight tolerances made this a difficult project however N&U techs were up to the task and successfully inserted the Passarelle. 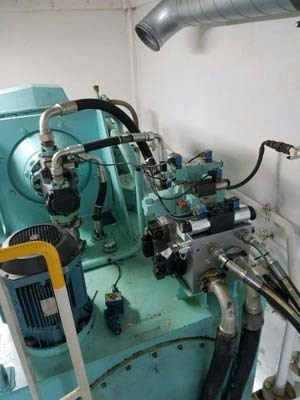 Nance & Underwood did an in-service hydraulic stabilizer repair performed onboard a cruise ship recently. 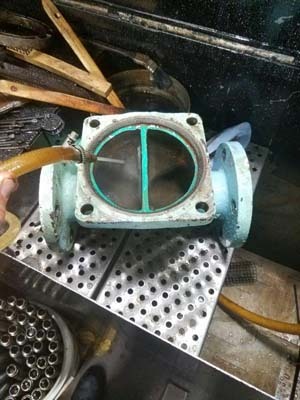 A big service job with a happy outcome for all. Nance and Underwood Rigging rebuilds yet another massive ship winch. This project was completed successfully under difficult conditions. Nance and Underwood Rigging of Fort Lauderdale Florida was among the 50,000 + visitors from around the world to attend the SMM, the world's largest and leading trade fair for the maritime industry. With 2,200 exhibitors covering 93,000 square meters of exhibition space there was a representative of every aspect of the maritime community. Venders Provided Ample Displays and Brochures for Equipment to Satisfy the Requirements for Vessel's from the Mega-Yacht to the Largest Cruise Ship and Every Type In-Between. 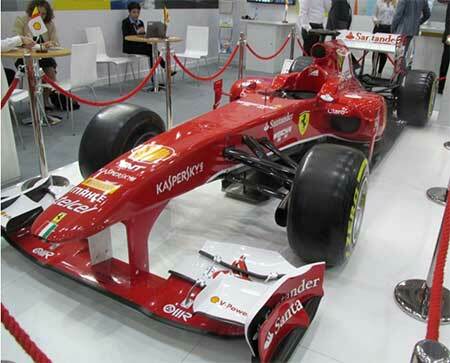 In Attendance were the Best Engineers and Sales Teams from Every Aspect of the Industry. This Event Occurs Every Two Years Due to the Size and Scope of the Business. Nance and Underwood sent a delegation to this event because the future of the Fort Lauderdale marine trade requires worldwide recognition and an open dialog with builders and providers operating within Classification Society's guidelines. To be certain 2018 N&U will attend SMM 2018 and strongly recommends that other local maritime service providers send a delegation also. 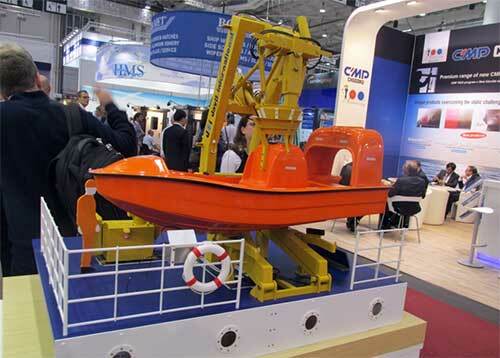 Houston Murphy will be attending the International Maritime Trade Fair- SMM Hamburg. 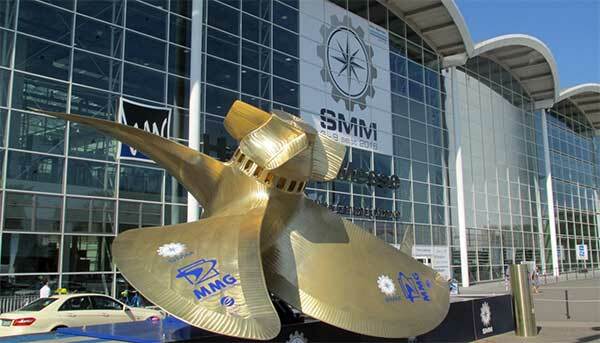 SMM Hamburg has all the leading commercial marine and mega yacht builders and services from around the world at the Fair. Houston will be available to meet regarding Nance & Underwood services for mega yachts, cruise ships and maritime shipping concerns. Contact Houston via Email or call 954-764-6001. 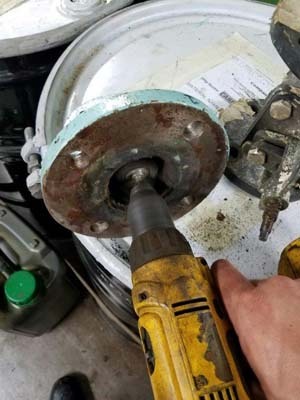 Petersen Stainless Rigging Ltd of England has been working closely with the Swedish company WireTeknik AB for the past two years to develop, test and certify a swaging system to EN13411-8. EN13411-8 is applicable to swaged terminations used in any wire rope assembly that performs a raising, lowering, hauling or supporting function on lifting machinery. As well as extensive fatigue testing requirements the standard stipulates a terminal efficiency factor, KT, of at least 90% of the wire MBL – significantly higher than for pressed-ferrule splices. 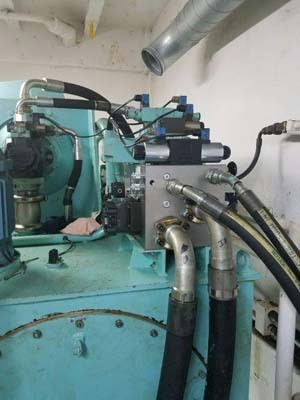 The approval covers the range of Petersen Swage fittings used on wire rope constructions 1x19, 7x7, 7x19 and 6x36+IWRC in sizes 4mm up to 26mm diameter and swaged with WireTeknik roller swaging machine. A diverse range of end fittings is available including threaded studs, open and closed sockets and unique captive-shackle toggling sockets. The different end fittings open up a whole host of new possibilities for attaching to the load or structure and custom end fittings can be produced for specific installations. The captive-shackle socket means that the shackle becomes part of the sling assembly and so does not require separate testing, certification and inspection. 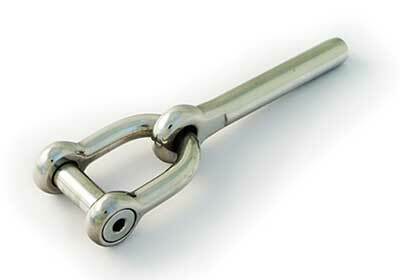 Contact Us for more information for your swaged rigging applications. 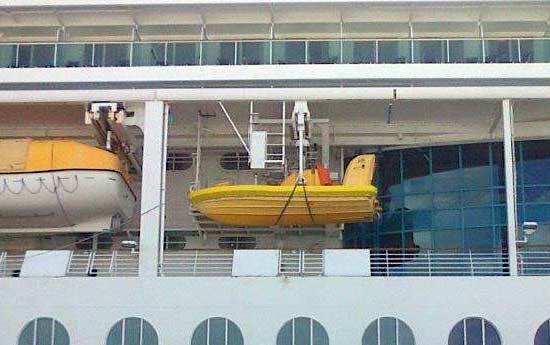 N&U Installed a newly designed and approved rescue on/off load hook aboard a mega-yacht here in Fort Lauderdale. The hook is built by Survival Craft Inspectorate (Survitec Group) and Certified by ABS as well as Lloyds register. This is a great design with easy maintenance. 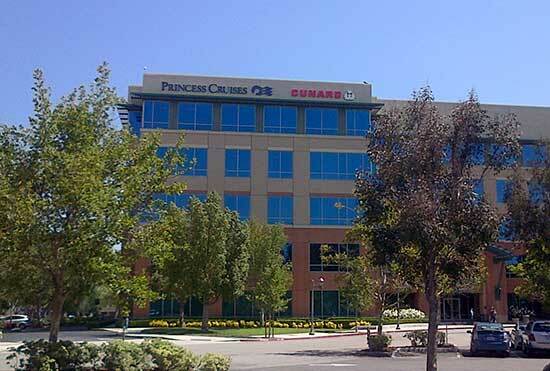 The week of 13-18 June Nance and Underwood Rigging Technical representatives attended meetings with Princess Cruises in Santa Clarita California; additionally performed a pre dry dock survey aboard a CLL Fantasy Class Vessel in Long Beach California; met with Technical superintendents from Holland America in Seattle, Washington. These meetings and surveys are taxing however N&U realizes the importance of face to face as well as hands on interactions to discuss the client' requirements. 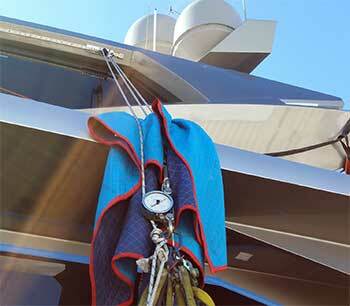 Above is a video of a dynamic load test performed for the yacht's staff as well as the ABS surveyor. This test of a Harken Safety Track required N&U to build a mock-up mimicking the hull structure. The test was performed numerous times with no failures! All Nance and Underwood Technicians have taken and passed the 10 Hour OSHA Maritime 1915 Training Course. One more certificate to assure that our clients are receiving the best we can offer for servicing their vessels. Searching the High Seas Looking for Talent to Join Our Team! 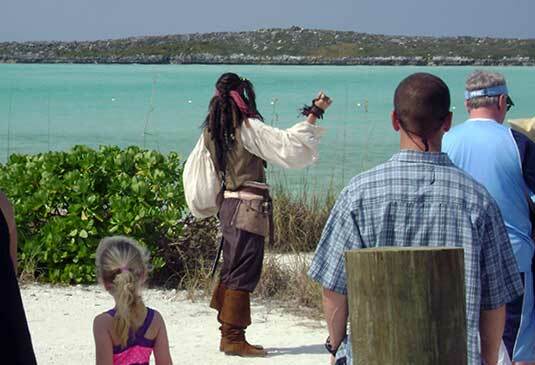 Above- Disney's Castaway Cay, Captain Jack Sparrow getting ready for a scene. 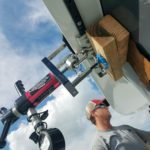 Nance and Underwood is currently recruiting experienced rigging technicians as well as experienced sailors looking to learn the trade. Please go to the Jobs Page to fill out an online application. 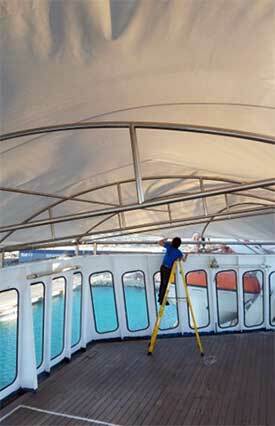 Nance & Underwood Rigging & Sails recently performed the refurbishment of a Lido Deck Canopy first at sea and then at the Grand Bahama Shipyard in Freeport, Bahamas. The Canopy refurbishment was a tough job but N&U were up to the work with proper planning ahead of the job and execution on site. See the detailed images and text on the movie above. Click to enlarge the movie for full screen. Nance and Underwood Sails loft manufactured these Fast Rescue Boat Fendering Covers (Sacrificial). See more images of Fast Rescue Boat Fendering Covers in the Commercial Gallery. Nance and Underwood performed a Life Saving Appliances Annual Inspection in Quebec, Canada recently proving Nance and Underwood Rigging will go anywhere, any time to do a job well and on time. See more images of Quebec Life Saving Appliances Annual Inspections in the Commercial Gallery. 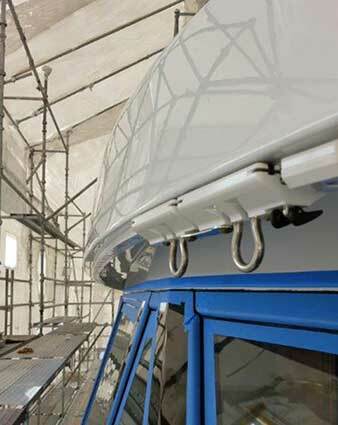 Nance and Underwood has installed this over the side Safety Rail System designed to match the hull color. Job well done! See more about the Ronstan Safety Rail System on the Nance Underwood web site. 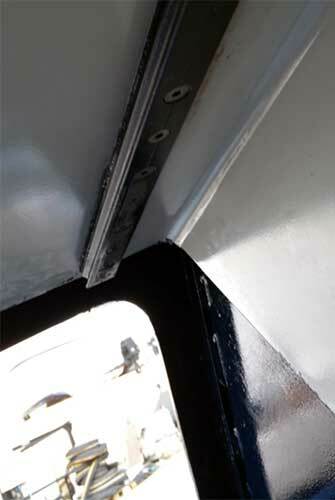 See more images and information for the Safety Rail System. See more images of Life Saving Appliances Annual Inspections and Life Boat Davit Refit in the Commercial Gallery. 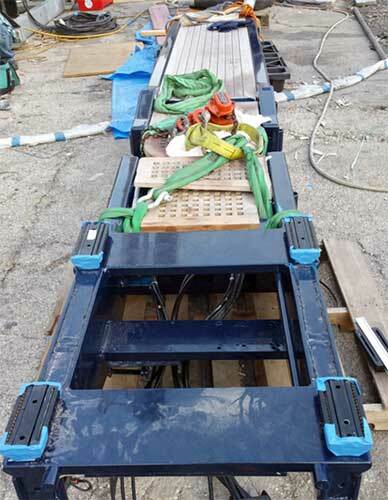 Our team of trained and experienced crew have been performing load tests of: Davits, Cranes, and Over the Side Safety Access Track Systems on a daily basis! See more images in the Yacht Gallery. 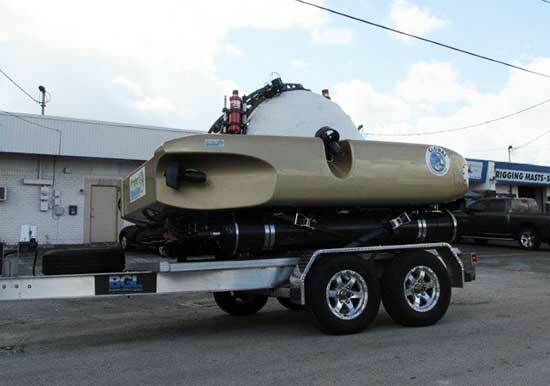 Always something new at Nance and Underwood- this awesome submersible came by for a lifting harness made of Spectra for craning the sub onto and off of the deck. 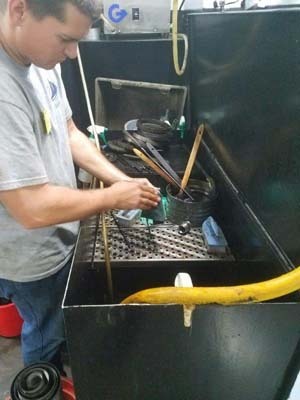 The lifting harness was custom fabricated at our Fort Lauderdale location. Nance & Underwood was at Seatrade Cruise Global (formerly Cruise Shipping Miami) March 14-17, 2016 here in Fort Lauderdale. Go to the Nance & Underwood 2016 Seatrade Cruise Global Page for more information. 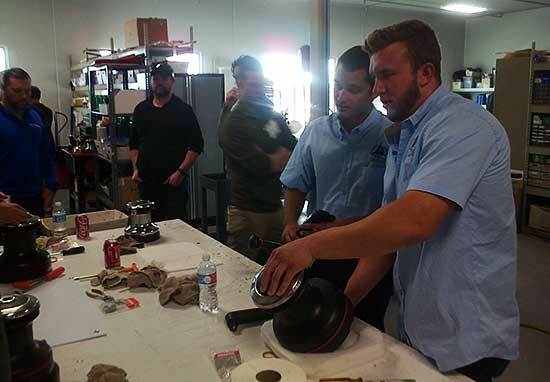 N&U technicians not only learned a considerable amount, they provided valuable insight to the factory technical support teams concerning the state of the maritime industry from sailing vessels to cruise ship and commercial vessel support. See more images in the Gallery. 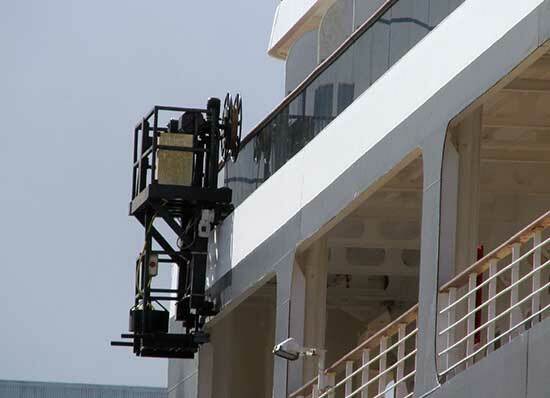 Nance & Underwood Rigging recently serviced a vessel's Skycon Rail Window Washing Systems. See more images in the Commercial Gallery. Continuing with Nance and Underwood's commitment to provide properly trained and qualified service technicians to address our clients expectations, N&U has elected to accept Harken Inc.'s invitation to send five (5) rigging technicians to attend 2016's Harken University Course at the Harken USA Factory in Pewaukee, Wisconsin. 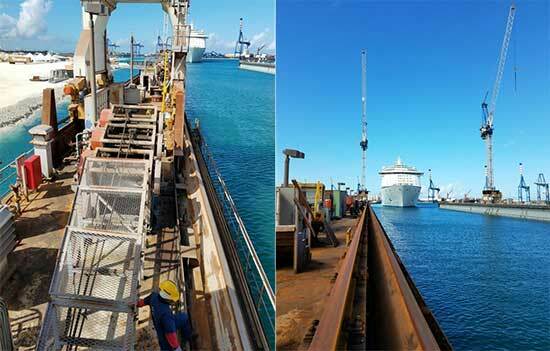 Nance & Underwood Rigging participated in yet another dry dock event at the Grand Bahamas Ship Yard. See more images in the Commercial Gallery. Nance & Underwood Rigging is now a member of Shipserv, an international source for commercial marine and maritme suppliers working via the internet. 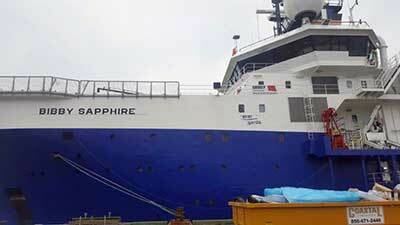 Much the way Amazon does, Shipserv also handles inquiries and payment online for marine services and equipment. Please see the Nance & Underwood Rigging Shipserv page for more information and to use Shipserv capabilities for complete service from requests through payment. Nance & Underwood Rigging welcomes all inquiries through Shipserv. 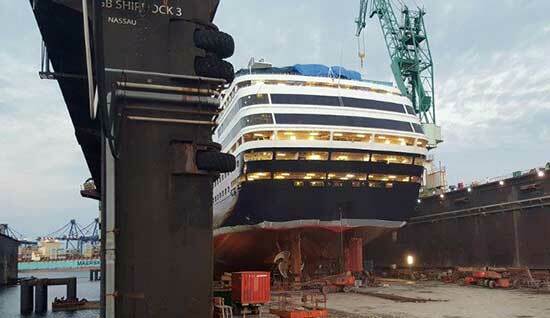 Nance & Underwood aided in servicing two cruise ships in back to back dry docks in Singapore. See more images in the Commercial Gallery. 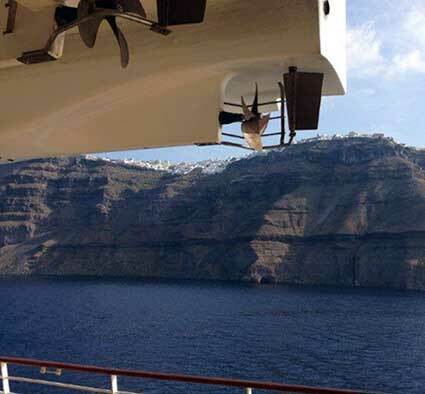 Nance & Underwood provided life boat and davit technical services onboard a cruise ship crossing from Athens, Greece to Istanbul, Turkey. See more images in the Commercial Gallery.